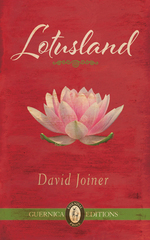 In a recent interview on “Sharing Vietnam” David Joiner speaks about his novel, Lotusland. He discusses his life in Vietnam, his fascination with the country, and his intention of bringing a new vision of Vietnam to western readers through Lotusland. Lotusland was published by Guernica Editions in Spring 2015. David Joiner, an American who moved to Vietnam in 1994, explains what impresses him about the country and its culture. He stresses his admiration of the “openness of the [Vietnamese] society” and explains how this helped him adapt to life in Vietnam. Furthermore, he explains the significance of lacquer painting in his novel– an element through which he attempts to display Vietnamese culture. Joiner elaborates on the significance of Lotusland as it relates to the complicated relationship between the United States and Vietnam. David Joiner is currently working on a second novel, set in 1990’s Vietnam and Cambodia. Tagged with David Joiner, Interview, Lotusland, NetViet TV, Sharing Vietnam.